Beau Burrows was the name on everyone's lips in 2016 -- and by "everyone," I mean "that small sub-slice of Tigers fans who both follow prospects and also live in West Michigan." So, basically, me and maybe eight other people. Still, I repeat, Beau Burrows was the name on everyone's lips. Now everyone's lips are kinda chapped. It's ok. There's always next year. 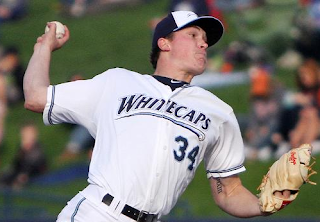 Burrows was the first-round pick in 2015, another clone on the assembly line of Big And Hard-Throwing Right-Handed Pitchers (Usually From Texas) that the Tigers love to draft. He was 18 years old. I want you to remember that, so I'm going to say it again, but this time with a bold-face font that's been italicized for emphasis: he was 18 years old. Everything I have to say that comes next belongs in that context. Let me just explain for a second what it means that he was 18 years old. Ok, now here's the useful information: he was 23 when he made his first MLB start, and that was just this year. 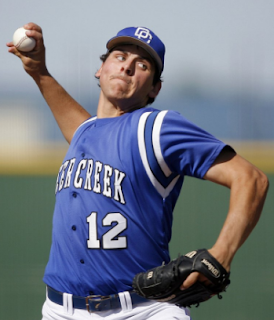 It took him a good five years to get to the major league level from high school. Daniel Norris was drafted at 19, and four years later, he's only made a total of 17 MLB starts spread out over three years -- and he's still not fully ready for long-term MLB action. It takes time, is what I'm saying. Yes, there are the freaks like Zack Grienke, who got drafted at 18 and started pitching full time in MLB just two years later. Or Matt Cain, who went from 18-year-old draftee to regular MLB starter in three years. And just forget about the super-freaks like Justin Verlander, who was drafted at 21, and the very next year was making his first MLB start, having skipped both the Single A and the Triple A levels completely. It's too early to analyze Burrows. He needs more time. But screw that, we're here to pick nits and predict the future, so weeeeeeeeeeeeeee!!! here we go. I've watched either three or four Burrows starts this year. I can't remember, because they were all so long and overly drawn out that I think I blacked out in most of them. Everything starts to blur together. Beau Burrows is the kind of pitcher who can participate in a low-scoring pitcher's duel and still take two hours to get to the fourth inning. Because he throws a lot of f*cking pitches. Because he can't find the damned strike zone. His approach to pitching seems to be "throw as hard as possible, and then leave the ball's destination to God's cosmic plan for the universe." He throws hard, there's no doubt, although I noticed that his velocity drops quite a bit after two or three innings. Out of the gate, he's sitting 94-96 MPH, stopping in now and then to visit briefly with 97 MPH. After a few innings (which usually means he's already thrown 60 pitches) he starts to sit in the 92-93 MPH range. When he can keep the fastball down, he does get some weak contact that results in soft ground balls. But the screaming elephant in the room, the thing that stood out immediately in the starts that I saw, was the lack of swings and misses. I finally kept a running count during one start, just to make sure my eyes weren't fooling me, and they weren't: he had an 8 percent whiff rate in that game. In other words: he can't hit the strike zone yet, and he's not missing bats, which means he has to rely almost exclusively on balls in play being converted into outs. Not usually a great plan. He has secondary pitches -- a sharp curveball, a changeup. But he can't find the strike zone with those pitches either, so they're not much help. It's easy to lay off even the hardest of curves when it's over your head or bouncing two feet in front of the plate. So the approach of opposing batters is simple: lay off the obviously wild stuff, square up the fastball. And they do. The first half FIP is fueled by the fact that Burrows gave up zero home runs, but the low K/9 rate was cause for some concern. In the second half, he's walking twice as many batters, while striking out half as many batters, and the numbers are starting to match the process. Call it second-half fatigue, call it natural regression for a pitcher who wasn't striking out many batters to begin with. Or just remember that he's only 19 years old, this is his first full season, and he's got some time yet to improve. Burrows has his pros and cons: a mid-90's fastball, even if it doesn't have a ton of movement; a sharp curve, even if he too-often throws it four inches above the strike zone; a fading changeup, a even if he bounces it too much. The fastball is above-average for its velocity alone, and the curve could certainly become an above-average pitch with a bit of work on his control. But that's why he's in the minors, right? He's not even old enough to buy his own beer yet. So the jury is out. If he doesn't improve on this season, he won't even see major league action. A minor improvement could put him on track to be a back-of-the-rotation starter, or maybe a bullpen arm. Some major improvements, and you might even see him turn into a number three starter. Take the winter off, Beau, and we'll check in again when you're no longer a teenager.